Assume a boat capsizes just before the finish line and drifts into the finish with the mast ahead and all crew still in touch with the boat. The question is when the boat finishes – when the mast top crosses the finish line or when the hull crosses the line. — All boils down to the question whether the equipment (mast) is in normal position or not. Definition ";" is "A boat finishes when any part of her hull, or crew or equipment in normal position, crosses the finishing line from the course side. However [...]"
Capsized is defined in ("A boat is capsized when her masthead is in the water."). It can be argued that the mast is still normally attached to the hull and, hence, is in the "normal position" – and the rule only talks about "normal position" and not about, e.g., "normal sailing position". But still. Follow up: I have been told that Q&A 2008-002 covers this. While I think Part 1 doesn't (as it is about whether 'normal position' also applies to the the hull), the answer in Part 2 about to the crew states: "Yes. It is normal for dinghies to capsize and therefore a capsized dinghy and its crew in the water are in a normal position." — If one follows that argument, also a mast top in the water is in the normal position (for a dinghy) and, hence, the crossing of the mast top counts. This has happened to me a number of times - as a sailing question, not a judging/rules question. My first challenge has always been to right the boat and get it sailing again. My second challenge was to convince the race committee that capsized WAS my normal position and the top of the mast should indicate my finish. Usually they, and the rest of the fleet, are laughing by then and happy to agree. I suspect the members of the 2008 Q&A Panal had shared my experiences. Unlike easing out the spinnaker halyard and sheets, it would be difficult to sucessfully argue that the capsize was on puporse and to gain an advantage. But, if the race committee came to that conclusion, I would recommend they took the first hull fitting as the finish moment and let the boat ask the protest committee for redress. 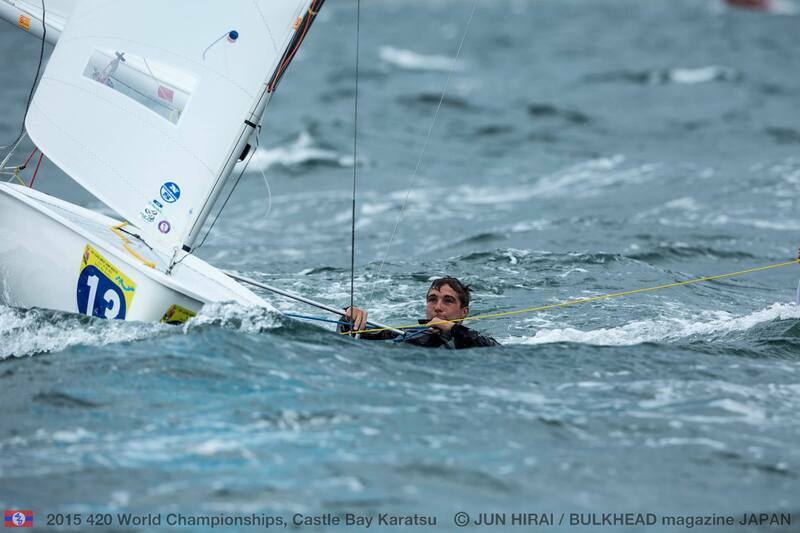 I can remember a slide shown at an IRO seminar a while back of a multihull going bow down just in front of the finish line and one of the crew being thrown forward. The body of the crew was crossing the line while in the air ahead of the boat but still managed to have a hand attached. The boat was deemed finished at the first instance the crew crossed the line as he was in the normal position for a boat catapulting. What is “normal position”? If the mast is still in place, it is in it’s normal position. If the boat is capsized, is it normal for the mast to be in the water while capsized? For me, the answer would be yes, the mast is in it’s normal position for a capsized boat, and if that is the first part of the boat that crosses the line, then I would give it a finish at that time. 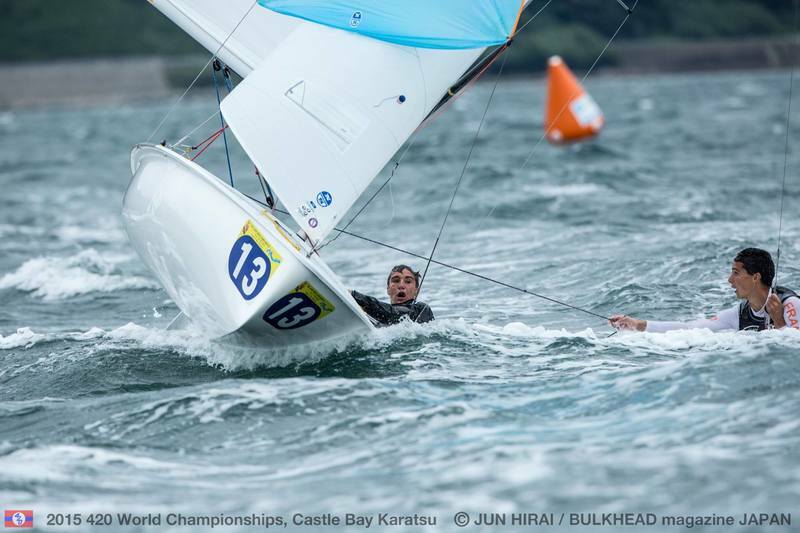 At the 2017 29er Worlds we had to ask one competitor their sail number as the floated across the finish line upside down. c) some of the crew members are not on board because they have become disconnected from the boat and its equipment, but are swimming to reach the capsized boat? Yes. It is normal for dinghies to capsize and therefore a capsized dinghy and its crew in the water are in a normal position. It follows that a boat finishes correctly in all of the conditions stated in the question. Also, the boat does not break rule 47.2 while the crew are making all reasonable attempts to recover the boat and get back on board provided they are not making any attempt to progress the position of the boat in the race. If they attempt to ‘swim’ the boat across the finishing line, they would break both rule 47.2 and rule 42.1, and possibly rule 2. If I may mention a private matter, I was eager this topic becomes an object of discussion. The definition Finish does not include any requirement about the crew being on board, however, rule 47.2 requires that any crew that has left the boat either by accident or to swim must be back on board before the boat continues in the race. A capsized boat that crosses the finishing line will finish as per the definition, but will break rule 47.2 if the crew are not in contact with the boat, except when they are in the water trying to right the boat. See answer 3. With respect to the definition of finish, does the condition "in normal position" refer also to the hull? No, the normal position refers to crew or equipment only. The commas before and after “or crew or equipment” in normal position limit the normal-position requirement only to the crew and equipment. I know well that the Q&A service is not to be used as a 'substitute' appeal process, but is simply to provide considered opinions on questions on the RRS. As compared with both Q&As, I think that it is not necessary the crew must be back on board. Because it is normal for dinghies to capsize and therefore a capsized dinghy and its crew in the water are in normal position. I am convinced that the old Q&A 2008-002 is correct. In case of Windsurfing, when a "board" is capsized and the hull crosses the finishing line, is she considered as finishing the race? If Q&A 2015.011 is valid, must the crew be in physical contact with the windsurfing board? And must the board return to the course side and then must crosses the finishing line again? No. Because rule 47.2 is deleted in WCR 2017-2020 B4. Therefore, the Q&A 2008-002 is much better and fair than Q&A 2015.011.
to the next RRS 2021-2024 on the World Sailing website? There must be RRS 47.2 revised edition. It may serve as a reference. Submiss 143.18 approved by the Racing Rules Committee IN November 2018, presumably for implementation in 2021 seems to solve the problem. Thanks all for the examples and references to the rules, proposals and fancy photos! The Racing Rules Committee Minutes of November 2018 are at http://www.sailing.org/tools/documents/MINRRFinal-.pdf — both were approved (12 in favour and 11 in favour/1 abstain, respectively). However, the wording of 165-18 was slightly modified (see minutes). Thanks Joan and Tobias for the references to the rules. We are looking forward the next RRS. 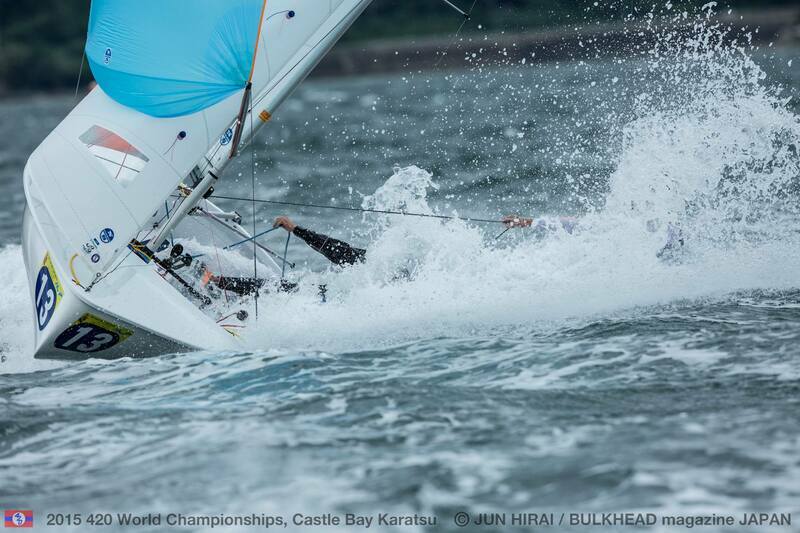 For reference, attached hereto photos which shows finishing scenes at 2015 420Class World Championships, Castle Bay Karatsu, Japan.